46 D I V E R S I T Y W O M A N W i n t e r 2 0 1 7 d i v e r s i t y w o m a n . c o m DW Life > D on't store credit card infor- mation, advises online shopping expert Frank DeBlasi, even if you shop a site frequently. "While convenient, it puts you at risk of identity theft and fraud if the site is ever hacked. Enter the card at each purchase." Don't shop on pub- lic WiFi, cautions con- sumer expert Andrea Woroch. "It's tempting to shop over your work lunch hour or while traveling home on the metro, but conducting any kind of financial transaction over public WiFi is unsafe." Wait until you're on a secured network, and check for the 's' in 'https' before checkout. Don't buy extra just to score free shipping. According to one survey, as many as 48 percent of us admitted to occasionally increasing the size of our orders to hit a free shipping minimum. 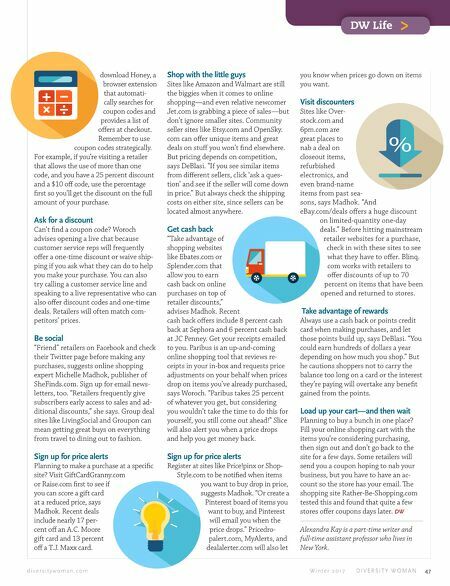 But don't bust your budget just to avoid paying delivery fees, says Woroch, who advises wait- ing for a holiday weekend to shop—when shipping fees are reduced or eliminated—or checking with FreeShipping. org to see if your retailer offers it. Or sign up for a free trial of ShopRunner.com for free two-day shipping at several popular retailers—just don't forget to cancel the trial. Don't be fooled by the MSRP. The MSRP is a suggested retail price given to the item by the manufacturer. But noth- ing is set in stone, says DeBlasi. "Before buying anything, find out what a small handful of retailers is charging, aver- age out the price, and make your decision from there. Don't forget to read the return policy. "One of the drawbacks of shopping online is when something doesn't Don't Do This Use these expert tips for what not to do when shopping online work out and you have to pay shipping fees or restocking fees to return it," says Woroch, who advises com- paring return policies from the different sellers offering your product and factoring that into your purchase decision along with price. For example, if one retailer is just a few cents more but offers a fab return policy with free return shipping and no restocking fee, it may be worth it to spring for the slightly higher price. Don't forget to shop safe. 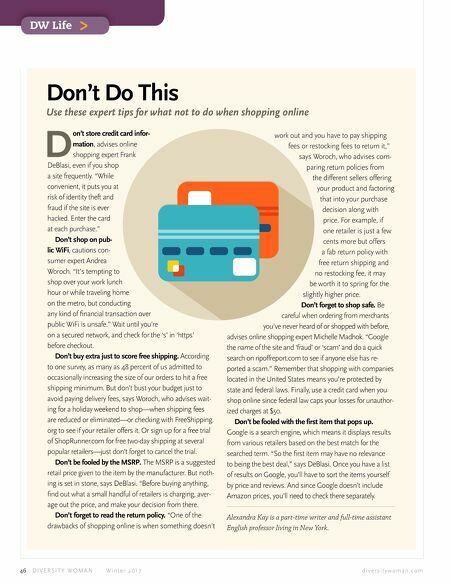 Be careful when ordering from merchants you've never heard of or shopped with before, advises online shopping expert Michelle Madhok. "Google the name of the site and 'fraud' or 'scam' and do a quick search on ripoffreport.com to see if anyone else has re- ported a scam." Remember that shopping with companies located in the United States means you're protected by state and federal laws. Finally, use a credit card when you shop online since federal law caps your losses for unauthor- ized charges at $50. Don't be fooled with the first item that pops up. Google is a search engine, which means it displays results from various retailers based on the best match for the searched term. "So the first item may have no relevance to being the best deal," says DeBlasi. Once you have a list of results on Google, you'll have to sort the items yourself by price and reviews. And since Google doesn't include Amazon prices, you'll need to check there separately. Alexandra Kay is a part-time writer and full-time assistant English professor living in New York.